Trailhead/Access: NC 50 and NC 98. Click on map below for specifics. 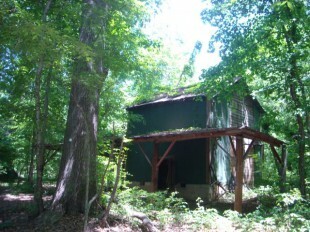 An old tobacco barn makes a good picnic spot on Section 10. Looking for a good, long, uninterrupted hike? Look to this stretch of rolling piedmont forest along Falls Lake from NC 50 west along the southern shoreline to NC 98. There’s much to recommend on this stretch. Solitude, for one. Unlike other stretches of Falls Lake, especially to the east, you won’t be bumping up against suburbia here. There’s also one of the best-preserved examples of the area’s pre-lake past: a tobacco barn and old livestock building at about the 3.5-mile mark. There’s also abundant natural beauty as well as anomalies such as a rock slab creek just over two miles in. If nearly 7 miles is more than you care to hike, there’s trailhead access at Boyce Mill Road, at the 5.8-mile mark. Odds are, though, you’ll be so scenically smitten you’ll want to forge on. Geology Highlights: This day-hike crosses the most significant geological boundary in this region, the Jonesboro fault. In fact, it crosses it three times, and runs along it in places as well. The Jonesboro fault records the opening of the Atlantic Ocean, and it separates older metamorphic rocks on the east from sedimentary rocks of the Triassic basin to the west. The fault is responsible for a change in the character of Falls Lake: to the east the lake is narrow and deep, while to the west it is broad and shallow. The lake comes into full view as the trail starts to curve around a cove. Trailhead: NC 98 at Lick Creek. Roadside parking.